Revenge drama ‘The Revenant’ and space adventure ‘The Martian’ took the top film awards at Golden Globes, setting them up as formidable Oscar contenders after a night of surprises and stinging barbs from return host Ricky Gervais. Pioneer-era tale ‘The Revenant’ won three awards, including best drama film, beating out front-runners "Carol," a lesbian romance, and investigative journalism drama ‘Spotlight’. Revenant star Leonardo DiCaprio won best drama actor and Alejandro Inarritu was named best director. "This is the most difficult journey I've embarked on," said Inarritu, who last year won directing and best picture Oscars for ‘Birdman’. "We struggled in low temperatures and difficult conditions to make this film happen, but we all know in this room that pain is temporary but a film is forever, so who cares?" In a closely-contested men's field, DiCaprio prevailed over ‘The Danish Girl’ star Eddie Redmayne and ‘Concussion’ lead Will Smith, to win best actor for his role as a fur-trapper seeking retribution. 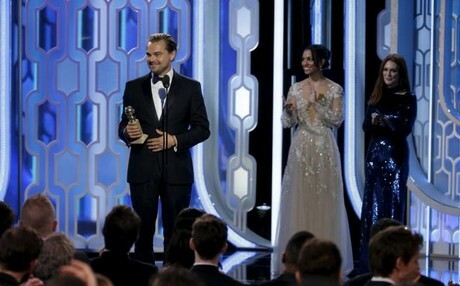 DiCaprio, 41, who has yet to win an Oscar, received a standing ovation and said he shared his award with indigenous people around the world. "It is time that we heard your voice and protected this planet for future generations," the actor, an environmental activist, said. The Golden Globes, handed out by the Hollywood Foreign Press Association, are the first major film honours of the Hollywood awards season that culminates with the Oscars on Feb 28. They can give much-needed momentum to films in a crowded field, and in recent years, top Globes have gone to movies that went on to win the Oscar for best picture. But it is also a more raucous and risk-filled affair than the Academy Awards, starting with the humour of the host. Gervais, who returned to the show as host after a three-year absence, sipped beer and took shots at everyone from Jennifer Lawrence to Matt Damon and at one of his favourite targets, the Golden Globes themselves. "Listen, if you do win tonight, remember no one cares about that award as much as you do," he said. Gervais riled up the audience with an opening monologue in which he called the A-list audience "disgusting, pill-popping, sexual deviant scum," setting the tone for the bawdy humour that filled the night. There were a large number of bleeped-out words during the telecast of the show, from Jonah Hill swearing while pretending to be the bear from ‘The Revenant,’ to Amy Schumer using an expletive while engaging in light-hearted banter with Lawrence. Damon won best comedy actor for ‘The Martian,’ about an astronaut stranded on Mars, and the film also won the best comedy/musical movie category. "I've made a lot of movies that people just didn't go to see, so to make a movie that people just enjoyed this much ... it really came down to (director) Ridley Scott," Damon said. Rising star Brie Larson, 26, beat veteran Cate Blanchett to win best drama actress for her role as a young woman held captive for years with a young son in ‘Room,’ while Lawrence won best comedy actress for ‘Joy,’ about the Miracle Mop inventor. Lawrence, 25, dedicated most of her speech to thanking ‘Joy’ director David O Russell, with whom she has made several films. "David, I want us to be buried next to each other. I really do." ‘Steve Jobs,’ a controversial look at the late Apple co-founder that floundered at the box office despite warm reviews, took home Golden Globes for supporting actress Kate Winslet, and screenwriter Aaron Sorkin. In the television categories, newcomers prevailed in key categories as USA Network's ‘Mr. Robot,’ a cybersecurity expert with social anxiety, won best TV drama series while Amazon's musical show ‘Mozart in the Jungle’ won best TV comedy series.